Difference between revisions of "ArchWiki:Statistics"
* '''Roles''' &mdash; a human-readable representation of the most relevant [[ArchWiki:Access levels and roles|access levels and roles]]. * '''Recent''' &mdash; the number of edits made in the past 30 days. Includes only normal edits, not special actions such as moving a page. * '''Total''' &mdash; the total number of edits made since the registration. Includes only normal edits (including deleted ones), special actions are not counted. 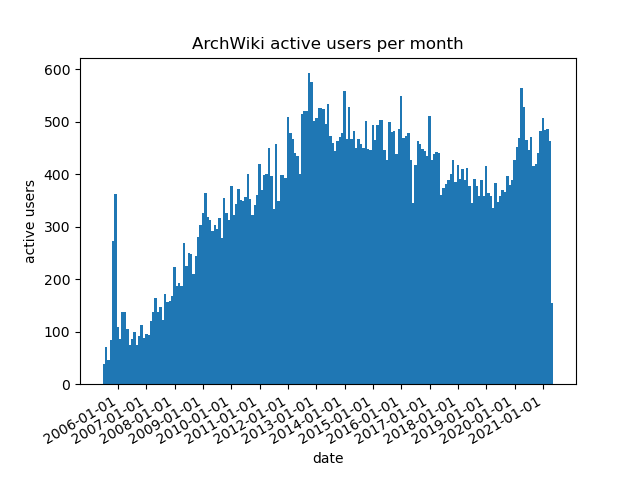 This page features statistics about the activity in the wiki. See also Special:Statistics and wikiapiary.com. This page has been last updated by Kynikos on 2018-11-10. This table shows the 54 users with at least 1000 edits in total, combined with the 376 users who made at least 1 edit in the 30 days between 2018-10-11 and 2018-11-10 (00:00 UTC), for a total of 411 users. Roles — a human-readable representation of the most relevant access levels and roles. 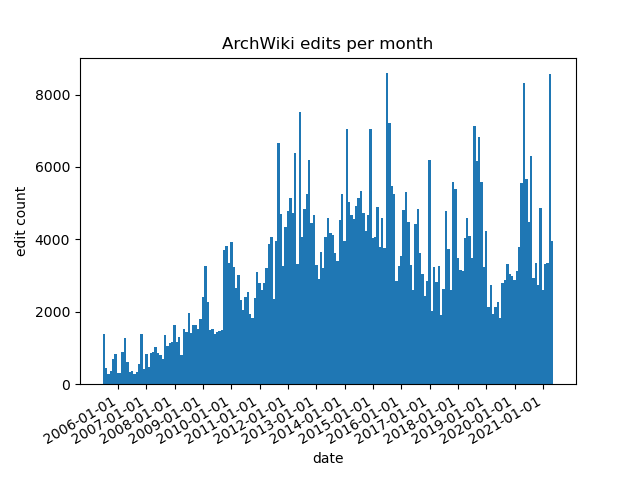 Recent — the number of edits made in the past 30 days. Includes only normal edits, not special actions such as moving a page. Total — the total number of edits made since the registration. Includes only normal edits (including deleted ones), special actions are not counted. Longest streak — the length of the longest recorded streak in days. The details for the streak are provided as tooltips. Current streak — the length of the last recorded streak in days. The details for the streak are provided as tooltips. Avg. (total) — the average of edits per day since the user's registration, calculated as the total number of edits divided by the number of days since the registration date until today. Avg. (active) — the active average of edits per day between the user's first and last edits, calculated as the total number of edits divided by the number of days between the user's first and last edits. This table shows the evolution of Special:Statistics values, updated approximately once a month. This table shows how many pages are in each maintenance category.